A . F . S . I . This is an 16 man invitation only event. Some riders not competing are also coming in to show off their skills, like Termite, Max and Makai, (so people can see what is actually possible at a younger age), and Cara, Tania and Jackie, (so people can see that women skim good too). 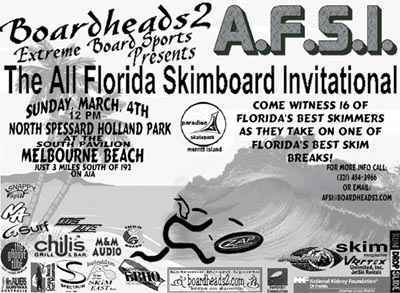 Of course every skimmer in Fla is invited to attend, but the competition stands at 16 riders. There will be media coverage and lots of local spectators. The county has approved everything for us to spend the day at their park to hold the comp, use their pavillion and bbq. We must have it spotless afterward. There will also be indoboard demos on the beach. Trophies are being made by a local guy known in the biz for his unique trophy making. (Not to be announced until the awards are given). Go the last beach access on the right. The park has indoor and outdoor showers, and changing areas in the bathrooms located at the middle beach access in the park. Please make plans to come join us, just hang out and witness some amazing skimming, or free skim with everyone after the comp. "Where We Make Locals Famous!"